The Green Mountain landscape is dotted with breweries that have established Vermont as one of the premier beer destinations in the World. We pack a lot into our little state— abundant local foods, great music, natural beauty and amazing beer. Vermonters know the finest things in life are best enjoyed with good buds. Friends and brewers Sean Lawson and Mike Gerhart have teamed up to create a beer that features the best qualities of each brewery. This was poured into a tulip. The appearance was a ruddy burnt orange to brown color with a one finger white foamy head that dissipated at a nice pace. Lacing was fairly clingy with ringy foaminess gracing the sides of the tulip. The smell started off with dried pine, dried mango, bitter orange rind, light honey, and a sticky sweet papaya to balance. The taste had a pure bittersweet bliss running into the previously mentioned flavors and slapping around the hops creating the flavor on into the aftertaste in a fairly sticky sweet to bitter fashion. On the palate, this one sat about a medium on the body with a nice semi-sticky bittersweet hoppiness clinging nicely to my tongue. Overall, this was a really nice DIPA that I would definitely have again. Pours orange with a thin white head that dissipates steadily. Sticky white lacing and some spotty white foam is left on the top of the beer. Beer is full of floating chinky particles suspended in the beer. It looks pretty gross. Beer aroma is very dank, lots of pine, sap and grapefruit. Malty backbone. There is a soapy character to the aroma. Taste has some notes of grapefruit and pine - very bitter. Tons of dank grass, sap and pine on the backend. Not much malt is noted in the taste. Feel is standard for the style. Medium carbonation. nothing special. Overall this is just an odd beer. I really can't get past the fact that the beer is full of chunky particles. It just looks gross. The taste is extremely bitter - up there with the most bitter of west coast style IPAs. To me, this is an ok beer - certainly nothing world class. But hey, its got the name recognition going (covering) for it. From the growler purchased at the WRJ Co-Op, it pours a moderately dark amber with a nice head. Lots of floral notes in the nose. Malt and a slight bitterness in the mouth. Good IPA! Pours cloudy gold with lots of chunks. Moderate head and retention. Aromatics are surprisingly subdued given the hype train and rarity on this one. Pine and some tropical fruit that you really have to get your nose down into the glass to find. Medium bodied and crisp. Bitter hops on the palate with barely a trace of malt. Pine and grapefruit pith with a lingering, building bitterness. Finishes bitter with lots of grapefuit pith. Finally tracked this down after three years and I'm pretty underwhelmed. Heavy on the bitterness and light on the hops in the nose and palate. 12 oz bottle poured into a stemmed tulip style glass. Hazy, orange color, and great citrusy aroma. Great collaboration between the two breweries, and I was excited to try a beer from Lawson's, which definitely represents well in this beer. 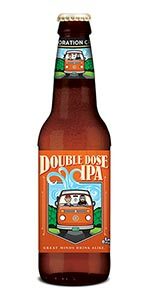 Dank double IPA!